People do strange things when they experience tragedy. Even finding solace to accommodate loneliness leads to drastic paths. A desperate househusband strays while his wife is away on business. He meets a woman. Has an affair. Tells his wife. And suddenly the pair find themselves in Texas where the wife enrolls in a training facility where she learns how to be the proper housewife. That's how things begin in Anna Moench's In Quietness. Presented by Dutch Kill Theater, In Quietness is a tragic story of a fading marriage and the steps the pair take to repair the cracks all while finding themselves. Gender roles are put on blast through the lens of religious expectancies. Moench takes a pair of strained New Yorkers and transports them to Texas where Paul attends Seminary school while Maxine serves as the welcoming committee at Homemaking House, living in a home in progress where impressionable girls are days away from learning how to be the perfect housewife. On their journey, we meet the matron of the right Terri and Maxine's do-right bunk buddy Beth. Moench's concept is poignant and a vital story. The ideas and themes that Moench presents are filled with much potential. But the final product she offers could use some clarity. No matter what, this story is Maxine's. It's truly her journey. Yet Moench bookends her script with monologues from husband Paul. And that's problematic in its own right. When it comes to Paul, with how and what we learn it, he's doomed. Right from the start there's no hope of salvation for Paul. He’s flawed. And lacks amiability. With an instantly unlikeable character, it sets up Max for victory, even if she too, is flawed. Regardless of this, if Max is in control of the piece, allowing her to lead in and out of the play could work to the play’s advantage. Moench establishes the first few scenes to serve as active exposition. At the peak of Paul and Max’s turmoil, Moench sends them to Texas to join a religious sect. But what was the cause of this move and why, are these two trying to repair their marriage, especially after the battle we previously saw? The explanation is strong but we spend an exuberant amount of time until we learn exactly why. Moench relies on anticipation but perhaps clueing in with more subtle hints would work to the story arch’s advantage. And that story that Moench has penned is something titillating. Whatever your views, the themes Moench addresses are significant, delicately placed in a character-driven drama. The dynamic between the three varying women is what drives the play to the finish line. Kate MacCluggage is truly the centerpiece of In Quietness. She is a catalyst for nearly every character. MacCluggage offers a grounded performance, strong and balanced. You can see the fight in her, even though you may not understand Max’s desire to fight. As her strayed but found the light husband Paul, Blake DeLong does everything in his power to make you like him. And that allows a glimmer of hope for his renewal. But no matter what DeLong does, liking Paul is no easy feat. Lucy DeVito’s Beth is something unique. DeVito is able to play upon Beth’s secret by keeping a guarded disposition. And when Beth reaches her breaking point, DeVito is at her finest. In Quietness needed some comedic charm and Alley Scott delivers. Scott plays the quintessential Southern Belle that smiles through the vile she spews. There’s a tenacity to Terri that makes you love her and strive to stay on her good side. Scott is the perfect person to be the leader of the Stepford Zombies. In almost a cameo role, Rory Kulz as Dusty defies the image of what you thought Dusty would be. Moench has Beth set Dusty up as this monster and Kulz’s Dusty is anything but. Is he suited for marriage? Likely not but Kulz manages to bring a bit of shock to the stage through his take on the character. Guiding this play was Danya Taymor. Taymor’s direction was solid when it came to focusing on the characters and their relationships to the world and one another. With a fluid staging, there was little dead space between beats. 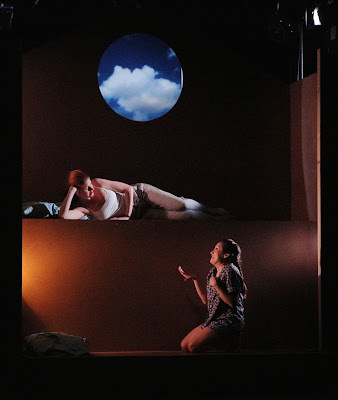 By having a unified connection with lights and sound, sound designer Asa Wember and lighting designers Masha Tsimring and Caitlin Smith Rapoport brought a take charge approach to the movement of the story. The lighting duo created some stunning stage pictures through light, especially in the night scenes. Wember’s quick percussive sound was exactly what the play needed. And Wember gets a win for the preshow song selection of Southern inspired country and gospel including Marin Morris’ “My Church”. On point? Yes. But that’s what made it work. With the lights and sound being so strong, there had to be one caveat. And that came in the form of the scenic design by Kristen Robinson. Here’s the struggle. As you walk into Walkerspace, you see this church-like set with a window to the heavens and a warm circular light cast centerstage. It’s an ominously hopeful picture. But when the lights truly rise to full, the true nature of the set is revealed. Yes, the house the characters live in is supposed to be unfinished but it didn’t read that way. It set read as seemingly untreated. And it’s unfortunate. While the construction of the set may also have been a bit wonky, the aesthetic felt unintentionally unfinished. Moench’s script makes reference to a field trip to Ikea by Pau and Terri. It’s a cute scene. And it makes sense that nearly all of the limited furniture used is Ikea items. It’s a bit tongue in cheek, I suppose. Especialy when you recognize the white chairs from your own home. Anna Moench and Dutch Kills Theater have potential on their hands. This play could be powerful. But it just didn’t reach the great expectations. There were many missed moments in execution. Nevertheless, In Quietness is a play to keep on your radar.